You can never have enough vegetable recipes and this one that uses tomatoes and courgettes is quick to make and can be varied to use up whatever is in your vegetable cupboard. Do not feel that you always have to use fresh ingredients. Having canned tomatoes in your store cupboard means you can turn a few ingredients into a meal in minutes. For those who work and do not have time to shop every day for fresh ingredients a can of tomatoes is a good standby product. 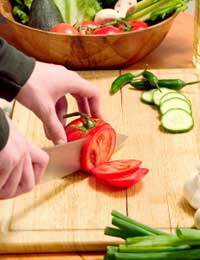 Why source, peel and chop fresh tomatoes when with a can opener you have the ingredients instantly. Courgettes were once hard to source and quite an exotic vegetable. Today they are as easy to purchase as mushrooms and peppers. It is not always necessary to purchase the perfectly shaped courgettes packed in pretty trays. Go for the net holding half a dozen off shaped ones. After all, once you have sliced and cooked them no one will know you spent a pound less and have twice the amount for your money! Heat the olive oil in a pan and add the chopped onion and garlic. Fry until the onion is clear. Thinly slice the courgettes and add to the onions. Continue to fry until the onion is golden brown and the courgette slices are slightly soft. At the same time place the pasta into a pan of boiling salted water and cook until al dente. Do not overcook or you will find that the pasta breaks up whilst in the oven. Drain the water from the pasta and add the onion and courgette mix to the pan. Stir carefully to mix the ingredients and then add the quartered tomatoes, the oregano, mozzarella and wine. Season to taste with the salt and pepper. Grease the insides of a large heat proof dish and pour the courgette mix in carefully. Tip in the can of chopped tomatoes and cover with the grated cheddar cheese. Bake in the centre of the preheated oven for about thirty minutes or until the cheese is golden brown and bubbling. Serve with crusty bread for a filling supper meal. If you find that the pasta bows are too soft for these recipes try some of the coloured spiral shapes or the wholemeal shell shapes. There are such a variety of pasta shapes available in the supermarkets and the prices so reasonable that it is not expensive to experiment with the different pastas and find one that your family enjoy eating.